Did humans kill huge animals in Snowmass 50,000 years ago? Dr. Steve Holen, curator of archaeology at the Denver Museum of Nature & Science, stands behind a giant Ice Age bison skull unearthed at the Museum's fossil dig at Ziegler Reservoir. 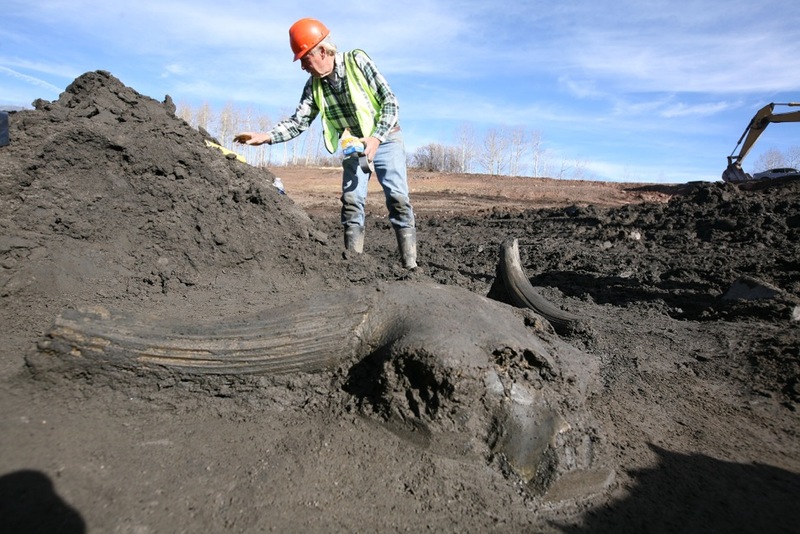 Do earthquakes explain all those mastodon bones at Snowmass? Not likely, say scientists, although they haven’t completely shelved the idea. And did humans kill a mammoth 50,000 years ago and then cache the meat for later use? Circumstantial evidence of rocks intermixed with bones suggests that was the case. If so, it would rank as one of the major scientific discoveries of the decade, putting people on the North American continent some 36,000 years earlier than what is now generally agreed upon by archaeologists. That intriguing idea also remains on the shelf, just beyond touch for lack of corroborating evidence. Discouraged? Hardly. Scientists still think the 6,000 bones plus leaves, pollen and other organic matter retrieved in two brief bursts of intense digging in 2010 and 2011 ranks as among the best time-capsules ever discovered from 50,000 to 130,000 years ago, the last glacial interlude. A layer of clay had created an exceptionally well-preserved archive of life at 9,000 feet during the last interglacial period. Spades upturned leaves still green and insects iridescent after 50,000 years. Logs that had gathered along the ancient shoreline were so well preserved that chain saws were used to slice them. “It’s really a crystal-clear picture into the ecosystem archives between 50,000 and 130,000 years ago,” Miller said. Occasionally during the digging there were shouts of glee as Miller and other scientists, plus geologists and other scientific specialists, triumphantly hoisted bones. They found the remains of 40 different animals, from mice to a mighty bison now extinct and a ground sloth many times the size of what now exists. There was also a camel. Mostly they found elephants: the grass-eating mammoths, three meters tall at the shoulder but with long, curving tusks and trunks shorter than those found in elephants today in Asia and Africa. Deeper in the sediments and more plentiful were mastodons, which are slightly shorter and have teeth better adapted to eating leaves and twigs. With the bones of at least 34 different individuals were out, it’s among the biggest mastodon discoveries ever in North America. Just how so many mastodon bones came to exist in one place perplexed the scientists. One early hypothesis was that an earthquake, or perhaps several at different times, had occurred while the mastodons were in the lake. Earthquakes can have the effect of liquefying lake sediments, anchoring whatever animals are stuck in them like quicksand and preventing escape. If they have not discarded that idea, scientists now favor a simpler explanation of individual deaths from less exceptional causes, the bodies then scavenged by various opportunists. Courtesy photo / Denver Museum of Nature & Science. 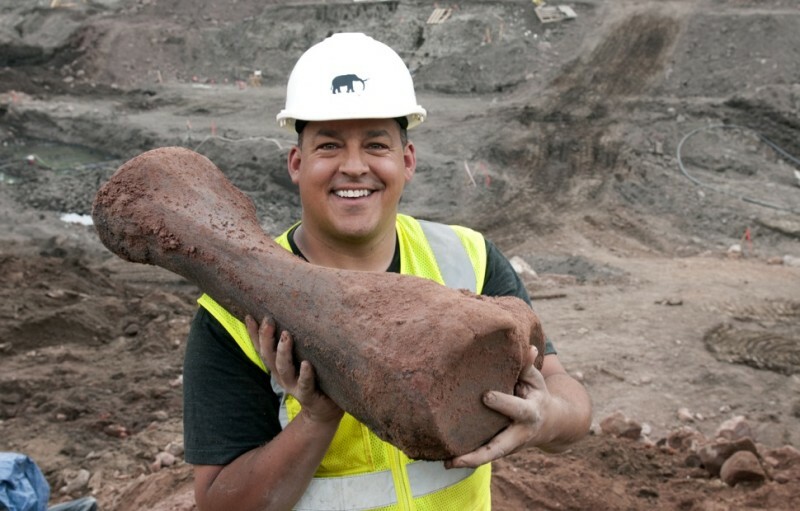 Paul Vallejos, a volunteer at the excavation at Ziegler Reservoir, holds a mastodon's tibia he found in 2011. amp; Science. But a mammoth found near the surface poses a mystery. Rocks were intermixed among the bones in ways that didn’t seem natural. Quietly, the scientists wondered if the rocks had been used by people to cache the meat, for later use. If that were the case, it would be one of the top scientific discoveries of the decade. Archaeologists have only been able to confirm human existence in the Western Hemisphere to about 14,000 to 15,000 years ago, near the end of the last ice age. This would, if proven, extend human habitation to 50,000 years ago. With the need to get out of the lake in 2011 when it was converted into a regulated reservoir, museum personnel wrapped this ensemble of mammoth bones, peat and rocks into a protective cast of plaster for transport to the museum in Denver. Once in Denver, they took three-dimensional photographs, so that scientists in the future can see everything just as they found it. Top archaeologists from around the country were invited to examine the remains. So far, that extraordinary evidence is wanting — and may remain so. “It will likely remain a mystery but sometimes that’s science,” Miller said. This acrylic painting by Jan Vriesen depicts what the scene at Snowmass might have looked like 120,000 years ago, during the last warm period in the interlude between glaciation. I’ve looked and looked and nowhere can I find if they said yes or no about ancient man being at the site 40,000 years ago. What I seen was ancient man being there with what they found and the rib having cut marks on it and furthermore I guarantee they found flaked lithic material there that they are keeping on the downlow. More big brother and the top dogs in the archeological community keeping information about our past from us as always. The most plausible explanation for the evidence of bones from 40 different animals some with human markings would be a massive amount of water carrying these items until it collects at a stopping point, then the water dissipates leaving a deposit of remains. However, personal bias and not science would cause a rejection of such a hypothesis because of its logical conclusions: that man existed during the same time as mammoths, the cause was a huge flood, and our assumptions in the current dating methods are flawed.